I finally found my Wild Dog on, of all things, the inventory list of George Gruhn, the eminent Nashville vintage guitar dealer. Now, that may not seem odd to you, but this was a long time ago. Back then finding guitars was done by eagerly getting the first printing of the Trading Times, a weekly newsprint want-ad rag that was published all over the country in localized versions. If you’re one of those young-uns who walks around with your nose in a smart-phone, “want-ads” were notices you paid to put in the paper if you had something to sell. EBay didn’t exist. Only Al Gore used the Internet. George’s list wasn’t in the Trading Times, but in Vintage Guitar Magazine, which was the Trading Times for old guitar junkies. Baldwin-Burns guitars are part of the madness that was the 1960s guitar industry. Baby Boomers like me liked guitars and corporations with money started buying up guitar manufacturers. 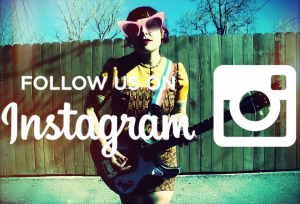 CBS and Fender, Norlin and Gibson, etc., etc. Among the early suitors for Fender was the Baldwin Piano and Organ company of Cincinnati. 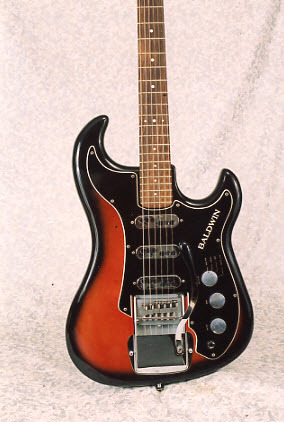 When Fender went on the block in 1965 due to Leo’s health problems, Baldwin tried to buy the company. CBS outbid them and that was that. At the same time, Burns of London, owned by Jim Burns, was having financial difficulties. Burns was more guitar “genius” than business wizard. The plan was to import Burns-designed and produced guitars carrying the Baldwin name. 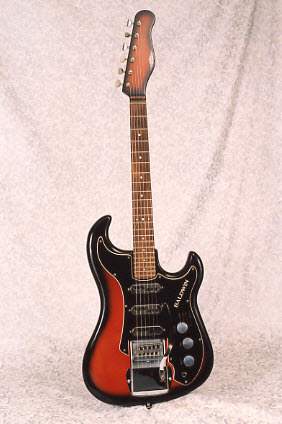 The first units began to arrive in late 1965 and this was a very early arrival of the Jazz Split-Sound model. Actually, this is pretty interesting in a number of dimensions. First of all, it’s a “Strat” configuration, although pretty liberally interpreted, with “notes” of the Burns Bison. Back in the mid-‘60s Fender’s top guitars were the Jazzmaster and Jaguar, which were most copied by both European and Japanese manufacturers. It’s early because of the head, which became a scroll design in mid-1966. 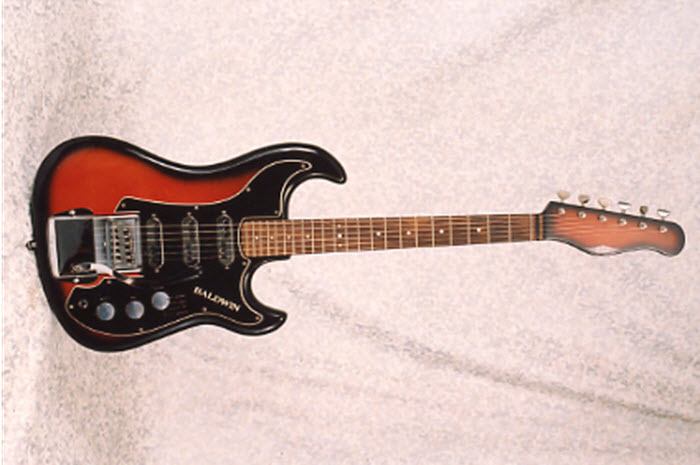 Like I said, Jim Burns was a pretty good guitar designer and this has one of his Series 2 adjustable vibratos. The pickups are a pretty interesting take on a humbucker, really kind of a hybrid, with offset coils and poles. This is, no doubt, the origin of the “Split-Sound” nomination. These are pretty cool, because the “Split-Sound” meant that the neck coils captured the bass strings and the bridge coils got the trebles. I’m not really sure you can hear the subtleties, but it’s dang cool none-the-less. The “Wild Dog” setting is, well, underwhelming. It’s basically an out-of-phase sound like you get in the in-between positions on a Strat, but the pickups aren’t really as hot as a Strat’s, so, while it’s cool—and pretty innovative—in a ’60s guitar, it’s really no big whoop. But good marketing! This is, for the times, a professional grade instrument, on a par with Fender or Gibson, with an entirely unique feel, of course. Burns doesn’t get the respect he deserves in the American market, and the Baldwin—and later Ampeg—monikers didn’t help with credibility, given the consumer illusion that a brand name had to equate with the manufacturer. Which it almost never has. Despite all the technical features that make this guitar desirable, there really isn’t any “Wild Dog” there. Maybe compared to a Kay or a Harmony electric. And to get Wild Dog out of a Strat, you needed toothpicks. Nada on Gibsons. That the “Wild Dog” setting was kind of disappointing doesn’t diminish the coolness of this guitar, but it certainly wasn’t what I expected. More like “Big Whoop.” But pretty good marketing! Wow! Plan 9? There’s a blast from the past! Bomp records? Or is my hemp-stained cranium having some memory issues? Just a whale searching for a porpoise? Groovy guitar, but I’d rather have my long lost Yamaha SG-3 12 string, with it’s amazingly groovy pickups and wiring scheme! i first met one of these along with a Baldwin Eliminator amp (sort of the steroid-fueled big brother to the Baldwin that Willie Nelson uses to this day) at Mel Bay Music when they came out. I was in my early teens but the staff kind of knew me as a player and they let me fondle it and even plug it in (with the volume set at about negative 10). I also got the admonishment not to set it on Wild Dog. i did anyway and was unimpressed. Still, it’s cool as anything. Mike Ripa…….hello, I am a huge Plan 9 fan. Are you saying Eric sold you his Ampeg guitar ? If so please, please take good care of it as I am sure you will. By the way do you recall what amp he was playing through in the early days it was an Ampeg I think but what model was it ? I did not get hip to the band till Keep Your Cool era…….I went to alot of shows around that time and still after all these years really love the band. Those early records you played on are really fantastic. Oddly enough it was listening to Plan 9 that finally made me commit to playing guitar….Eric turned down my request for lessons at one point….and I dont fault him for it but I wonder what I may have become under his tutelage. I live in CA. now and have lost touch but I suppose I should write Deb and Eric to thank them again for all the hours of joy their music has brought to my life and I thank you too. I have an Ampeg/Burns Wild Dog purchased new in the early 60’s from Manny’s Music. I used it extensively in my garage band days, and have played it off and on since then. The playability and finish seem unfazed by many years moderate abuse. It was a wonderful investment that still provides some fun. Never did figure out what that Wild Dog sound was supposed to be. I own half-a-dozen Burns guitars. Their labelling does not describe the tone settings they can produce. My 1963 Split Sound Baritone/Bass (24.75 neck and tremolo arm !!! ), when set to Jazz, produces exactly that tone found on Sunshine of Your Love. Unsurprisingly, Jack Bruce had on e of these rare instruments. Anyone who has a Bison with the A-B Switch and the four-tone dial will know that it produces eight radically different tones, all very 1960s, from Woman Tone to wiry Surf sounds. Jim Burns gave his customers something that all guitar makers should be obliged to offer – he wired up every possible combination of pickups in the cradle, so that a three pick-up guitar offered seven sound combinations. 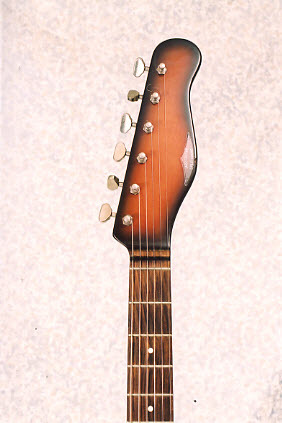 Several of the early sixties Burns guitars had the “split-sound” feature and the “wild dog” tone (the Bison, Split Sonic and Jazz Split Sound). I have been a Burns fan since 1964 when I purchased my first Burns, but for me the split-sound feature and wild dog tone setting were nothing more than a gimmick – only if you played finger style did the split-sound feature seem to have any advantage, with the E, A and D strings from one pickup mixed with the G, B and E strings of a different pickup. The “wild dog” tone was (to my ears) a very piercing, but thin, treble sound, with only a few possible applications (like, say, “Man of Mystery” or “Midnight” by the Shadows) and where the lead guitar had to cut through the sound of the rest of the band (especially if you had a loud drummer)! But for the most part, the “split-sound” pickups and wild dog tone were a disappointment. 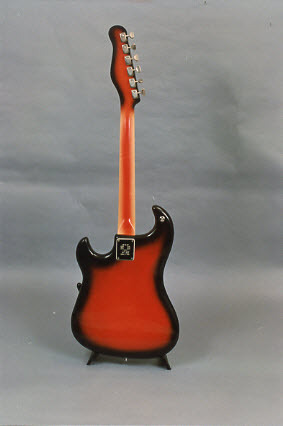 The Split Sonic guitar had a brother – the Vista Sonic, and the Jazz Split Sound guitar had a sister – the Short Scale Jazz. Each of these guitars had “normal” Tri-Sonic pickups – and (to my ears) both sounded better than the Split-Sound pickups. Why Burns did not simply produce a 3 Tri-Sonic pickups Jazz (as well as the 2 Tri-Sonic pickups Short Scale Jazz) is a mystery. For me the 3 pickup Jazz looked great, but was let down by its Split-Sound pickups – 3 Tri-Sonics would have made it a great guitar. I have a 2 pickup Short Scale Jazz (with Tri-Sonic pickups) and can vouch that it is an excellent sounding guitar. The pickups are excellent for clean and distorted sounds and the guitar really sings through a Marshal! Unfortunately, as with the Split Sonic, the Jazz Split Sound catches the eye, but not the ear! Back in the early 1970’s I put together my first jazz-rock band and needed an electric guitar at short notice. My friend Rick very generously lent me his immaculate black Burns Bison. At our first gig I recall that my friend the late blues singer Roger Barnes kept shouting, “Give it some more ‘wild dog’ Andy”, much to the amusement of me and the rest of the band! Since then I’ve owned several lovely guitars, including a Gibson Les Paul ‘Black Beauty’, Fenders Stratocaster & Telecaster, Tokai Strat., Yamaha SA2100 and Eastman AR 403 – lovely guitars all of them, but no Wild Dog! I have a Sunburst Burns Bison made around 1963 and I am trying to locate a circuit diagram showing the ‘wild dog’ hook up. The guitar has been in bits for the last 30 years and I have been trying to restore it to it’s original condition. I have located all the parts I need but the wiring diagram has been difficult to locate. Any help would be appreciated. My Bison has 3 pickups. I have a 1963 Burns of London/Ampeg Wild Dog 6 string in very very good condition in the original case and has the tool kit with it. I am willing to sell it. The head stock says jazz guitar/split sound. The pickguard says Ampeg bu Burns of London. It is all there. Complete and original and plays excellent. The book Pearls and Crazy Diamonds about 50 years of Burns guitars 1952-2002 comes with it $1600. A sunburst 3 pup Bison sounds like a nice onel. is it original or a re- fin? Do you want to sell it? I have a translucent cherry red model 1963 which is very rare and maybe the first of only 5 ever made in this colour. Eddie you needed a circuit for your Bison. Here is one that may well suit you. 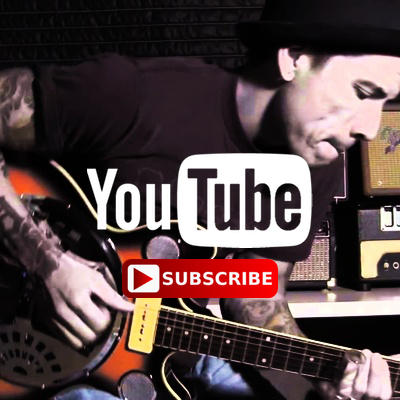 Just click on the below link then click on ‘supporting information’ you will see photos of guitars and a circuit with Wild Dog that you will hopefully find is what you need. I could still be interested in buying your Bison bits if you ever sell it. Please let me know via this site and Zi will send you my contact details.